Editor’s Note. Below, you will find a call made by a friend of our platform, artist Nika Dubrovsky, to participate in a very worthy initiative in support of Mikhail Beketov, the independent Khimki journalist who was left severely crippled after he was attacked by unknown assailants two years ago. Nika’s initiative has been under way for a while and formally wraps up on Saturday, but everyone should feel free to write to her (at her blogs, listed below) to express their support or, better yet, donate money the Beketov assistance fund to pay for a rose or for his continuing medical treatment. At 4:00 p.m. on Saturday, November 27, we are going to give roses to Mikhail Beketov. The flowers will be given to him by Rada (Rada & Ternovnik) and several LiveJournal users (if anyone wants to join them, write! For the time being we have only two people who are in Moscow). After long deliberations and conversations, it has been decided that the money should be sent directly to the account of the Fund to Assist the Journalist Mikhail Beketov. For the time being, the fund only has a bank account (in rubles and euros) and a Yandex Money account ( 41001783925783 mbeketov-fond). Over the course of the next two days, the fund’s volunteers will add a Web Money account and will also add a special page where the names (or usernames) of all users who participate in the flower action will be entered daily. Therefore, when you send money, don’t forget to immediately send a letter to the fund’s e-mail address: spravdoy.pressa@gmail.com. The volunteer handling this is named Vika. She has informed us that she will reply to all letters; if you do not receive a reply, send your letter again. While the fund still does not have a PayPal account, I will provide my own: paypal.de@x-31.com. I will account for the payments made and publish the nicknames (or surnames) of the people who support Beketov. You should also send me an e-mail (nika@x-31.com) with your surname or username. All the money collected will be taken to a flower shop that has agreed to roses from suburban Moscow at the cost of one euro per rose. Each flower will bear a little name tag (“To Mikhail Beketov from…”). For us, the principle one rose-one person is important. Our action is first and foremost an expression of our disagreement with the court that ruled that the crippled Beketov was guilty of slander. The flowers are signatures on a petition to the authorities, as well as a sign of respect and support for Beketov. After my first post, some people offered their help in organizing the action, while other, indignant users demanded that the money be gathered not for flowers, but for food or a wheelchair. It is my opinion that the Beketov fund definitely needs money. Beketov will soon be visited by a German doctor, who will arrange to continue Beketov’s medical treatments in Germany. Everyone who feels that one euro for a flower is a blow to their budget can transfer one euro to the fund’s account with the note “not for flowers.” But, since we are on the topic, you could also send one euro for a flower, along with another ten euros for food and to pay for medical treatments. However, we should remember that Beketov was not crippled by random hooligans. While we worry about how to spend our hard-earned euro, the people who commissioned this crime not only are still at large, but they also continue to engage in robbery. Even a superficial search in the Internet turns up evidence about the millions of euros received through kickbacks, bribes, and threats to foreign and Russian companies. It’s a good thing that the Union of Journalists has awarded Mikhail Beketov a medal for bravery, but why can’t the authorities give him a worthy pension for the rest of his life and pay all his current and future medical bills? A thousand roses at one euro each might give voice to this demand. That same thousand euros, if spent on his medical treatments, will disappear almost instantly. Please donate one euro and (or) link to this post and (or) write your own post. If you do not have money or a way of sending money, but you are also in solidarity with Mikhail Beketov, leave your username or name in the comments. I am certain that people will come forward who will send in 2, 3, 5 or 10 euros and will be glad to inscribe you at their own expense. That is the point of “one euro, one flower”: so that we can pay for each other. Protesters holding Orthodox Christian church banners and icons, singing prayers and throwing eggs helped to bring the city’s first authorized lesbian, gay, bisexual and transgender (LGBT) demo to an abrupt end in St. Petersburg on Saturday. According to organizer Maria Yefremenkova, around 20 counter-demonstrators were already at the site of the planned demo when around 10 LGBT activists arrived. “They stood there and sang the Lord’s Prayer and some psalms, but the main problem was a bunch of highly aggressive middle-aged men, who were indignant that the police were not dispersing us, but protecting us,” she said. Later on, a group of 40 men approached the demo, stopped 20 meters away from it and began throwing eggs at the participants, despite the police presence. According to Yefremenkova, the officers looked at a loss for a while, but then detained some of the attackers. With the police distracted, the men standing near the demo rushed at protesters, seizing a rainbow flag and banners, tearing down a stand and starting to trample it, she said. Yefremenkova said that activists recognized some of the attackers as belonging to nationalist organizations such as the Russian Imperial Union Order and People’s Council (Narodny Sobor). According to Yefremenkova, the demo was stopped 40 minutes after it had begun, when a representative of the district administration approached the organizers and asked them to discontinue the event for security reasons. “It was even said that if we didn’t stop it ourselves, they would stop the event because the security of participants was under threat,” she said. The demo was timed to mark the United Nations’ International Day for Tolerance, observed on Nov. 16. Yefremenkova said that the activists had prepared a performance portraying the history of their relationship with bureaucrats, Orthodox believers and judges, but had no chance to perform it. “They are three sources of homophobia, we believe,” she said. According to Yefremenkova, the police failed to fully protect the activists. “Considering the nature of the event, they should have surrounded us and acted more decisively in regard to the provocateurs,” she said. City Hall and local district administrations had repeatedly refused to sanction any LGBT rights rallies until this month. Each of the nine locations proposed for a gay pride event in June was rejected by the authorities on various grounds that the activists described as “derisive.” Five activists were detained when 19 protesters tried to hold a demo without a sanction. According to Yefremenkova, the Moskovsky district administration refused to authorize a small rally as late as last month. Last month, a St. Petersburg court ruled that City Hall’s ban of June’s gay pride event was illegal, while the European Court of Human Rights ordered Russia to pay damages to a gay rights activist for unlawful discrimination by the Moscow authorities, who repeatedly denied him and other activists the right to hold gay pride marches. Yefremenkova said that in authorizing Saturday’s event, the authorities may have been influenced by the court rulings and the rally’s theme of tolerance. “We do have a tolerance program in St. Petersburg, even if the issue of homophobia is not featured in it in any way,” Yefremenkova said. About 10 men in masks tried to attack the participants of a discussion on hate crimes but were fought off. In Kyiv, Ukraine, on November 20, 2010, during the Transgender Day of Remembrance of those who have been killed due to anti-transgender hatred, unknown persons attacked “A Response to Violence against Transgender People,” a peaceful gathering organized by the NGO Insight and the Visual Culture Research Center. The organizers had planned a film screening, discussion, and flash-mob with paper lanterns. About ten unknown men broke into the Visual Culture Center as the film Boys Don’t Cry was being screened. The attackers had apparently planned to break into the screening room, which contained over thirty spectators, and attack them with tear gas. However, due to the prompt reaction of organizers and activists, the attackers were stopped at the entrance and forced out of the room. One of the organizers, Timur Lysenko (coordinator of Insight’s transgender program), who first confronted the bandits and blocked their access to the room, was beaten up. He and his colleague Anastasia Medco (from the NGO Fulcrum), who also resisted the bandits, were heavily poisoned by tear gas. The attackers fled the scene. Timur was diagnosed with internal injuries and facial chemical burns. All spectators present in the room during the attack suffered from the effects of the tear gas. At the moment, several complaints have been submitted to the police by event participants who suffered during the attack. Organizers demand that the authorities recognize that the attack was a preplanned, organized hate crime. Transgendered people are often subjected to violence fuelled by hatred. According to a TGEU research project on transphobia, more than 420 murders of transgender persons have been reported since 2008 worldwide. In Ukraine, due to the lack of a monitoring system and the reluctance of law enforcement agencies to classify such cases as hate crimes, the problem of xenophobia and hate-based violence remains invisible. The number of ultra right-wing attacks on peaceful gatherings for LGBT rights and against discrimination has increased over the past two years. In May 2010, two men tried to bring a smoke bomb into the cinema during a film screening that was part of the LGBT festival Queer Week. In September 2009, both presentations of the queer anthology “120 Pages of Sodom,” held in Lviv and Kyiv, were attacked by ultra right-wing groups followed by physical violence against participants. On the night of September 30, 2009, the Kyiv art center I Gallery was burned down following a discussion of the attacks on the queer anthology presentations and the official ban of the film Bruno. Homophobic inscriptions were left on the walls of the burnt gallery. Editor’s Note. The text of the press release has been lightly edited to make it more readable. On the morning of November 16, a column of more than a dozen cars invaded the square outside the Smolny [Petersburg city hall], their drivers honking their horns in a deafening manner. Simultaneously, people bearing placards and banners began converging on the pedestrian island in the center of the square. Many of them wore the orange helmets and bright-colored vests of construction workers. Journalists bolted towards them, joined by the stunned policemen who guard the residence of bourgeois dictatorship on Dictatorship of the Proletariat Square. With the support of activists from the Center for Workers Mutual Aid (TsVR), members of Rubezh (“Stand” or “Border”), a union of garage owners, and residents of Petersburg dormitories protested against the lawlessness of business structures and the corrupt city bureaucracy. The garage owners and dorm residents decided to act in concert because the problems they face are quite similar: both groups are being robbed and deprived of what little they have — rooms in dorms and garages in a garage co-op. And this is being done by major corporations that possess gigantic resources and official protection. Just like Khimki outside of Moscow, the outlying Petersburg quarter of Parnas (“Parnassus”) has become a hotspot on the map of the city in recent months. This is not a metaphor: a war really has flared up there, with battles, barricades, and marauders. Everything began in 2007, when the administration of the city’s Vyborgsky District sold the land where garage co-ops Parnas-1 and Parnas-2 are located to Glavstroi, a construction corporation owned by the well-known oligarch Oleg Deripaska. The land was sold without encumbrances − that is, as if the marsh that had been there before the garages were built were still there. However, in fact there were nine thousand garages located there. While the district administration did not extend its rental contract with the co-ops, which are legal entities, this decision did not take into account the property of physical persons, the garage owners, who naturally sought compensation payments in the courts. The courts turned them down. That was when the garage owners formed Rubezh, which in 2009 fended off an attack on Parnas-4, and has carried out several vociferous mass actions in 2010. After using police and the OMON to disperse the garage owners, the district administration tried to keep aloof and gave the co-op over to wholesale pillage. No fewer than a thousand immigrant workers are laboring there round the clock to haul away the scrap metal. They cut up the metal, load it onto carts, and then haul it away in banged-up GAZelle trucks. At night, they work with headlamps attached to their heads… The gates are guarded by immigrant mafia toughs, who admit people onto the grounds of the co-op for a bribe of 5,000 rubles [approx. 117 euros]. [Ethnic] Russian marauders who arrived were beaten up and had the tires on their GAZelle slashed. A garage owner who got onto the grounds of the co-op and tried to drive marauders away from the remains of his garage was also beaten up. In these conditions, where the authorities are invulnerable, people’s rage is directed against immigrants… Both the inevitability of conflict and its utter senselessness and pointlessness are obvious… The actions of the Vyborgsky District administration have led to an exacerbation of ethnic hatred and the risk of inter-ethnic clashes. At present, the battle for Parnas-2 continues. On November 8, the garage owners built barricades and managed to repel the first attack. People’s despair is growing, however. The situation has been pushed to the limit, and spokespeople for Rubezh confess that it might get out of control at any moment. The inaction of the authorities, especially Governor Matviyenko, becomes more of a provocation with every passing day. Residents of former industry-sponsored and institutional dormitories are one of the most disadvantaged categories of laborers in Russia. When the organizations that used these dorms became private firms in the nineties, these residential spaces were privatized along with them, despite a ban on this procedure. For a long time people had no idea that their dwellings, which had turned from temporary to permanent, belonged not to the city, but to their capitalist owners. However, after the term during which they could have legally challenged these privatization deals ran out, dorm residents were subjected to blackmail and terror on the part of the new owners, who, stopping at nothing, began forcing residents to sign one-sided rental agreements. Those who either did not want to pay or could not pay were told to hit the streets. Not everyone evacuated the dorms with bundles and suitcases in hand, however. Many people took to the streets with placards and banners. At present, a pressure group that unites residents of several Petersburg dorms (including the dorms located at Ilyushina, 15; Peterhof Highway, 73; Pilotov, 13; Podvoiskogo, 46 and 48; and on Garkavogo Street and in Pionerstroi. These people demand that residents not be evicted unless they are provided with alternative housing that meets the social norms for Petersburg and the Leningrad Region; that a permanent commission consisting of city officials, dorm resident pressure groups, and dorm owners be formed to solve the problem; and that a program for defending the housing rights of citizens residing in dorms be adopted. On November 8, as the garage owners were building their barricades at Parnas, the dorm residents picketed the city’s housing committee. Several days later, at an assembly of TsVR activists, these two groups decided to unite their efforts. Insofar as Petersburg authorities systematically violate freedom of assembly, having practically closed the greater part of the city center to demonstrations and pickets, the protest action outside the Smolny took the form of a flashmob. Aside from garage owners and dorm residents, it was planned and carried out by activists from TsVR and such leftist organizations as Socialist Resistance, DSPA, and RKRP (Russian Communist Workers Party). As usual, the protesters were supported by independent local legislative deputy Vladimir Fyodorov, thanks to whose intervention (and, possibly, Allah’s, insofar as significant numbers of police had been dispatched to monitor celebrations of Eid al-Adah (Kurban Bayram), which took place the same day) arrests were avoided. Despite the fact that the protest was almost spontaneous and for obvious reasons had been planned in secret, it was covered by journalists from Petersburg TV-100 and other media outlets. The authorities have reacted to the protest with their trademark cynicism. 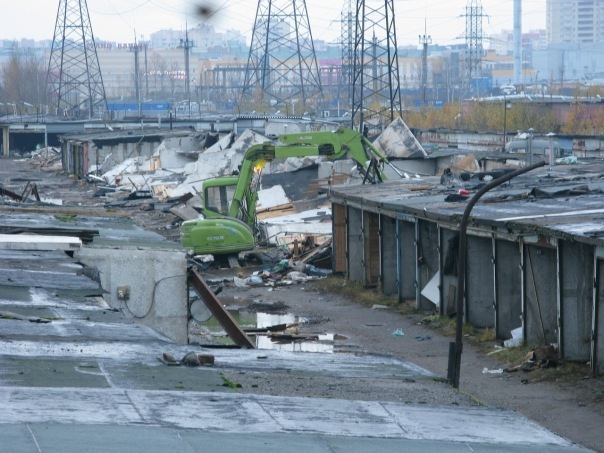 Commenting on the conflict at Parnas, Dmitry Kurakin, chair of the city’s state property committee, said, “Citizens, the owners of the garages, should bear the expenses for disassembling and disposing of their own garages. We are not going to free them from these costs. There are no plans to compensate them monetarily.” We should memorize this quotation. This is the answer that laborers will give to the Deripaskas and Prokhorovs when the red banner is raised over the Smolny and the oligarchs began to crowd outside, demanding the return of their nationalized business empires. The struggle continues. Editor’s Note: Thanks to Comrade M. for bringing the inserted video and this article to our attention. Photo courtesy of Socialist Resistance. 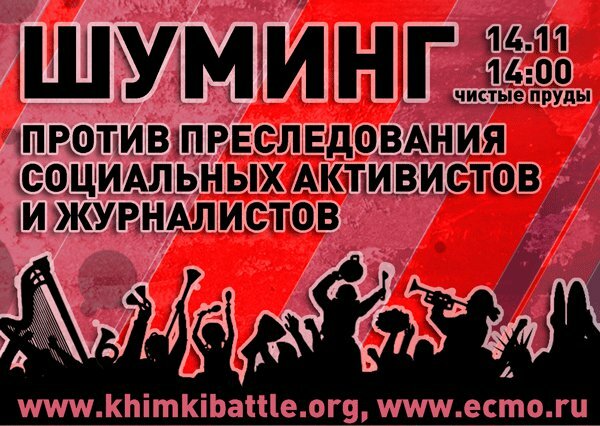 As antifascist activists marked the fifth anniversary of the murder of the 20-year-old antifascist activist and punk musician Timur Kacharava on Saturday, they claimed that they are under increasing pressure from the police, while the threat of attacks from nationalist radicals has not decreased. Antifascist Filipp Kostenko filed a lawsuit against the Prosecutor’s Investigative Committee last week after four anti-extremism Center E operatives broke into his apartment, searched it and arrested an activist, Rinat Sultanov, who was there at the time. The investigators had called the fire brigade to break down the metal door to get into the apartment. The three activists who were in the apartment were thrown on the floor and kicked in the stomach, Kostenko said Thursday. “When I came 15 or 20 minutes later, they were still lying on the floor, but I asked the [officers] to stop this and they put [the activists] into different corners,” he said. Kostenko said it was done to intimidate the activists on the eve of the Nov. 4 antifascist rally and prevent the rally, of which he was one of the organizers, from taking place. The rally, called “Defend the City from Fascism,” was held to counter the extreme nationalist Russian March that took place on the same day, and was authorized by City Hall. Sultanov has been charged with “inflicting grievous bodily harm” during an incident that took place on the Russian March on Nov. 4, 2008. According to Kostenko, the investigators took computers, magazines and banners for the rally, among other things. Lawyer Iosif Gabuniya said Thursday that a complaint against the actions of the investigator who conducted the search, and an application for the opening of a criminal case against the investigator have been filed. According to Gabuniya, the investigators committed a number of violations during the search, including refusing to allow him to enter the apartment to observe how the search was being conducted. “I think the actions were illegal and the rights of my client were violated, and that’s why I believe that the court will find them illegal,” Gabuniya said. Kostenko said that the authorities turn a blind eye to the activities of nationalist organizations in St. Petersburg. “They do arrest neo-Nazis who are directly involved in terrorism, but many nationalist organizations are aimed at cooperation with the authorities,” Kostenko said. According to Kostenko, the threat of attacks committed by nationalist radicals against antifascist activists is still high, as an attack on the fans of the Karelia-Discovery Soccer Club at a soccer match in the town of Pushkin in August demonstrated. Dozens of fans of the club, who are widely regarded as sharing antifascist views, were beaten. “At some point it appeared to be decreasing, but after the attack in Pushkin it became clear that the threat is still here,” Kostenko said. “They have even progressed to the next level, because to attack a full stadium of fans, that’s quite a well planned action, and it shows that nationalists, although in the underground, are getting ready for some very decisive actions and are capable of carrying them out,” he said. For the murder of Kacharava, four extreme nationalists were sentenced to 2 to 12 years in prison and three received suspended sentences in 2007. Dozens brought candles and flowers Saturday to an annual vigil near the Bukvoyed bookstore on Ligovsky Prospekt where Kacharava was stabbed to death. Photo by Sergey Chernov. See his complete photo reportage of the memorial for Timur Kacharava here. 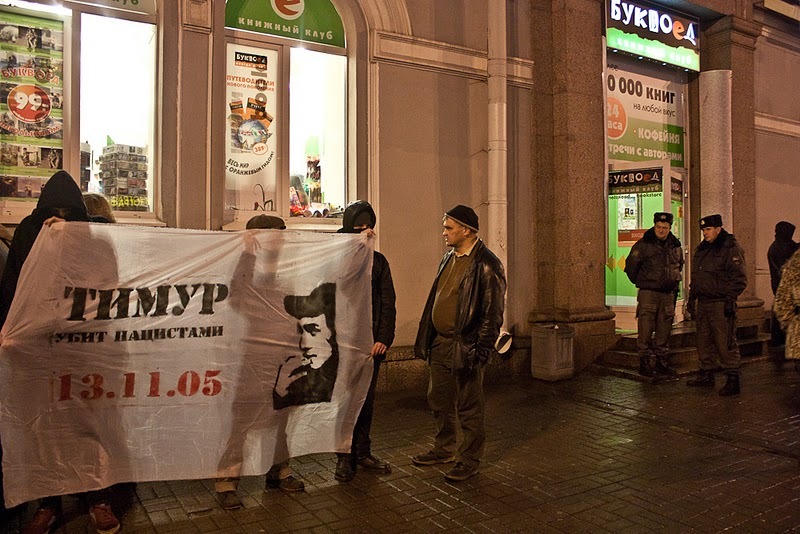 Two years ago a wave of terror against social activists and journalists rolled over Russia. Newspaper editor and activist Mikhail Beketov was severely beaten in Khimki. In Moscow, persons unknown attacked sociologist and activist Carine Clément. In Vsevolozhsk (Leningrad Region), independent trade union leader Alexei Etmanov was also attacked by unknown assailants on multiple occasions. In Yakutia, trade union activist Valentin Urusov was framed by local police on a drugs charge, tried, and sentenced to several years in prison. In response to this terror, social activists held a demonstration at Chistye Prudy in Moscow that was attended by a few hundred people. Two years have passed. Police have still not identified and arrested the people who assaulted Beketov, Clément, and Etmanov. Valentin Urusov is still serving time in prison for a crime he did not commit. Today we are witnessing a repeat of the events of two years ago. Environmentalist Konstantin Fetisov has been severely beaten in Khimki. Unknown assailants have attacked and severely beaten journalist Oleg Kashin. The authorities are trying to frame antifascist activists for crimes they did not commit. In Zhukovsky, thugs beat up journalist Anatoly Adamchuk. We believe that these new tragedies are the result of apathy in our society, which two years ago was unable to force authorities to find and punish the guilty parties in those dark events. The time has come to put an end to this, for if this time the criminals are not found, the atmosphere of impunity will untie the hands of all other scumbags once and for all. Instead of being shocking exceptions, these acts of terror will become a matter of everyday practice. At 2:00 p.m. on November 14 we ask you to come join us at Chistye Prudy in Moscow. We realize that there is no point in long speeches. It is unlikely that anyone can learn something new, something that has not been published in the Internet. And so we suggest that you bring with you anything that can make a lot of noise as a symbol of your rage and indignation. Silence and calm is exactly the reaction aimed for by those who jail, cripple, and murder people who disagree with the existing order. 11.11. 2010 – 16.01. 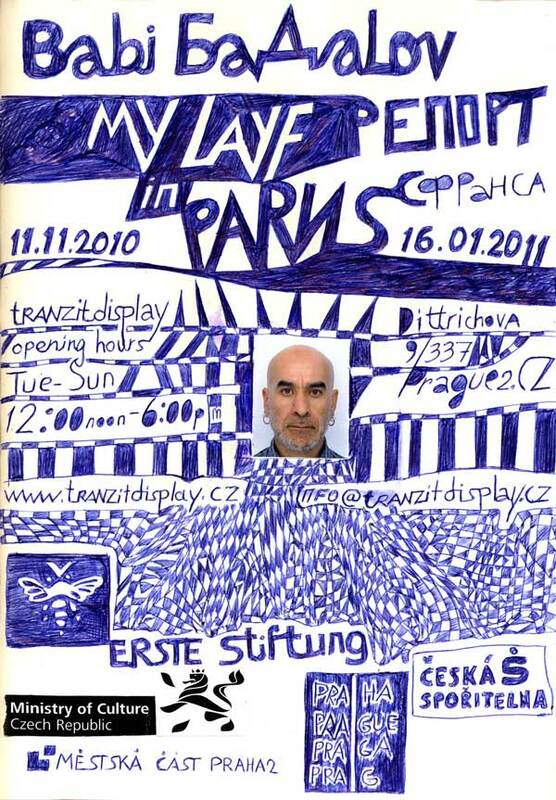 2011 • opening Thursday, November 11, 8 p.m.
Babi Badalov is an artist and poet. His visual poetry very often takes the form of a diary, created every day through a combination of his own linguistic research of manipulated pictorial material, mainly with political content. He uses drawing to complete various collages on pages, often organized into books. In writing, Badalov uses a combination of Cyrillic and Latin characters and those of all languages that he knows – from Persian to Russian to English and French. A record is very often maintained through a phonetic logic, then creating unexpected combinations and word play that are possible owing only to such radical means. The drawing often blends with the writing creating a collage, sometimes as though it overflows and fills the format in an unexpected horror vacuum. Very often this consists of ironic political commentary, ridiculing policies and social events, integration processes and mainly the EU asylum policy with which the artist has sufficient experience. Babi Badalov was born near the Iranian border in Azerbaijan, but has lived the life of a nomad in recent years, partially forced, when through various reversals in fortune he ended up in France, where he is now requesting asylum as a political refugee, and partially from the longing to live in an open society without prejudices where he can be a poet without having to worry. Babi Badalov decided to exhibit at tranzitdisplay his visual diary from asylum homes and from his current home – the streets of Paris. Unfortunately, due to the very strict terms for granting asylum in France he cannot attend the exhibition personally. The linearly installed double-sided A4 pages guide us through the latest extremely depressing eight months of the life of a person who awaits in fear and frustration for “redemption“ in the form of civic identity mediated by the authorities. On the one hand, we see the endlessly long communication with the bureaucratic system that endeavours to encumber as much as possible the granting of asylum and, on the other hand, we see a schematic collage from pieces of printed and signed papers, transportation tickets and product packaging that are traces of human existence on the edge of society. Babi Badalov (*1959, Lerik, Azerbaijan), is an artist and poet living in Paris. He has exhibited in Thessaloniki, Tallinn, Athens, Amsterdam, San Francisco, Istanbul, St Petersburg, Dresden, Cardiff, and Milan. His works have been collected in museums and private collections such as the Russian Museum, St Petersburg; Azerbaijan State Museum of Art, Baku; Museum of Art, Emden, Germany; and Martigny Art Museum, Switzerland, and Museum of Modern Art in Antwerp, previously MuHKA. opening hours Tue-Sun 12:00 noon – 6.00 p.m.